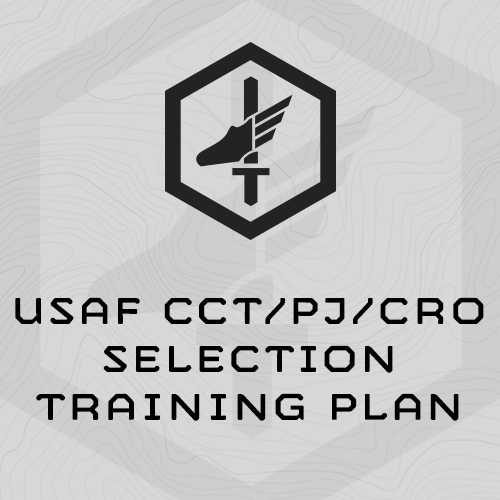 Intense, 9-Week training program specifically designed to prepare athletes for the USAF Combat Control, Pararescue and Combat Rescue Officer selections. This 5 day/week training plan includes multiple 2-a-day training sessions, as well as Saturday mini-events, and swimming, load carrying, and extensive rucking and running. Emphasis is on PAST improvement, running (1.5 and 6 mile), Ruck Running, Heavy Rucking, extensive swimming (1500m, Hypoxic Swims), treading water, and bodyweight calesthentics – the exercises and events you’ll face at selection. Stop Watch with Repeating Countdown Timer – smart phone will work. Optional – GPS-enabled Stop Watch with repeating countdown timer. A GPS enabled watch will make measuring run and ruck distances easier. - Individual Body Armor (IBA) or 25# Weightvest. Also, the training time required to devote to complete the time is extensive. During the train up, training for selection needs to be a priority during your work day. 2 Mile Ruck at Interval Pace based on SESSION 6 Heavy Ruck time. Ruck Run 1 Mile at Interval Pace based on SESSION 2 finish time. 30 seconds treading water, followed by 15 seconds with left hand out of the water, followed by 15 seconds right hand out of the water, then immediately .. I wanted to send along my gratitude for the programming and assistance you provided over the past few months. Last week I went through a USAF Special Tactics Officer Selection. The week was full of grueling workouts and leadership challenges. Your CCT/PJ/CRO Selection plan left me more than prepared to handle it all. Can recommend some changes as someone who followed your program exactly and then went to selection? First, put STO in the title! It works perfectly for those of us trying to become STO's as I'm sure it works for CRO hopefuls too. Personally, I was weak in my sit ups to begin with. Overall the PAST preparation was great, but I wish there was more of it. The once a week focus on calisthenics might not be enough for people needing work on their muscular endurance. I might suggest throwing in an extra day or workout for calisthenics. Overall the plan is great. These were minor things that I altered or fixed on my own, but might help another hopeful in the future.